The flavor-centric introduction of the class acknowledges the transition magic undergone, eliminating the erstwhile arcane/divine divide in favor of the new magic traditions of Starfinder; as such, the mystic theurge tradition is seen as a form of pioneer in the context of Xa-Osoro. The mystic theurge archetype behaves, to an extent, behaves as a kind of magical archaeologist and, as written, the archetype is written to be compatible with the Starfarer’s Companion’s classes. The archetype gains alternate class features at 2nd, 4th, 6th, 9th, 12th and 18th level. It should be noted that the archetype focuses on spells and as such requires pretty much spellcasting: All alternate class features, except the one gained at 9th level, would be esoteric spell lore. At each of these levels, you choose a spell list other than your own and a chosen spell from that list that is not on your class list. You add the chosen spell to the spell’s known, and if you employ another external way to prepare your spells, you add the spell to that receptacle instead. Once you have chosen this spell, you may not change it later, though e.g. if you’ve chosen a spell with a variable spell level, you may replace the lower level version with a higher level version. It should be noted that this does not allow you to choose race-exclusive spells, nor spells taken from a bonus spell-list à la mystic connections. When you choose this spell, it must be one level lower than the highest spell-level you can cast. EDIT: I believe in owning up to my mistakes. I have erroneously stated that this would be useless; however, Starfinder’s 0-level spells are no longer divorced, nomenclature-wise, from the “proper” spells, making this aspect work as presented. Mea Culpa! On the plus-side, the 9th level casters (of which I’m not biggest fan) in Starfarer’s Companion do get alternate rules pertaining that – ½ the highest spell level you can cast +1. The other alternate class feature, gained at 9th level, would be spell synthesis, which allows you to cast two spells at once as a full action: One from your class spell list and one chosen via esoteric lore. The spells must have a standard action casting time or less and the ability requires 1 Resolve to activate. If you spend 2 Resolve instead, you gain +2 to overcome SR with both spells. The interaction with concentration has been streamlined and now works properly. The pdf foes come with a new feat, the Combine Spells feat that requires levels in more than one spellcasting class, which allows you to cast 1st level or lower spells using spell slots from either spellcasting class, but at +1 spell level slot required. The feat may be chosen multiple times and each time, it applies its benefits to one spell slot higher. The pdf closes with a flavorful half page text on how mystic theurges behave in the Xa-Osoro system. Editing and formatting, on a formal level, are very good. On a rules-language level, some hiccups and ambiguities have crept into the file. Layout adheres to the two-column full-color standard of the series and the piece of full-color artwork is solid. The pdf has no bookmarks, but needs none at this length. EDIT: Alexander Augunas’ mystic theurges are a per se nifty take on the concept. 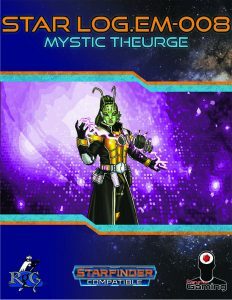 The revision of the file renders the mystic theurge a worthwhile take on the concept, granting the pdf a new verdict of 4 stars.